As I mentioned in yesterday’s post, Motor Man and I went to the Outer Banks Saturday and drove up on the beach at Carova. It’s a habit of mine to always take a picture of the beach as we’re riding along. Today, I’m sharing the picture I took Saturday, but I’m also showing you how one little mouse click can change a photo. My camera is capable of doing SO much more than I currently do with it. And, perhaps one day, I’ll learn what all those settings mean. But, in the meantime, I have a secret weapon that I sometimes use to spice up a picture. I hestitated to share this, not wanting my readers to think that I use this on all my photos. The changes made using “I’m Feeling Lucky” are frequently a little too dramatic. Personally, I feel this edited photo is a bit over the top. Thankfully, the automatic setting on our camera seems sufficient for most of the photos that I take…..until I learn how to really use it. 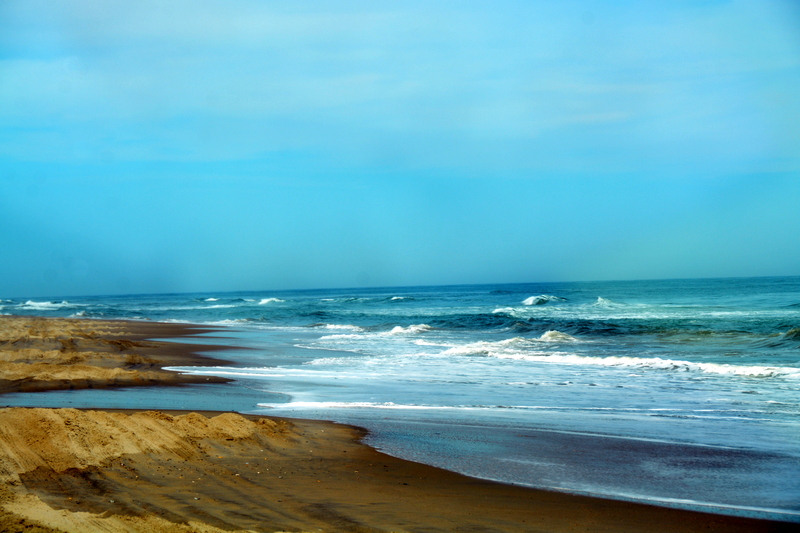 This entry was posted in Traveling Days and tagged carova beach, outer banks nc, picassa i'm feeling lucky. Bookmark the permalink. Amazing isn’t it what one little button can do? What was a “soft” lazy photo became heightened with a lovely touch of drama ……nice effect!! Wow! It looks like a painting. Beautiful! I was going to write the same thing, Jill. It turned your photo into what looks like a painting!! Both are beautiful! Thanks for sharing. I prefer the original…Thanks also for the pack of pics. They are priceless and I am So happy she had the foresight to label everyone.. The photos are lovely and beautiful respectively. There are so many choices with those settings to match any mood. Have a lovely day. I agree that it took a soft picture and made it into a dramatic canvas print. I like the soft, I think, better, but it is amazing what that one little button can do. Wow! That looks like a gorgeous painting! Amazing. It’s a great picture and it is fascinating to see what a little editing can do.I use Picasa myself and have lots of fun looking at all the different effects even though I usually elect not to use them. I do crop things a lot and I like that “lucky” button too. I’ve used that and there is one on iPhoto that I like much better. But more often then not the original is better. Even with my iPhone pictures. It’s nice to have options! Especially if I’m going to paint from the photo I took. i use picassa, too. i use it to crop, brighten or darken, export as a smaller pixel size with the copyright tag on it for the blog. i will sometimes play with the presets it has, like vignette or pencil drawing, etc. that shot was / is beautiful! Looks like quite the button ! Makes me wonder what would happen to some other photos if they were run through this filter ?! I think your shot is much more life like even if the other is deeper colors. Both are nice! I do agree, the enhancing of the colors brings out the beauty and the ‘texture’ of the photograph. But, you still did all the hard work in getting the perfect photograph, in the first place! Smiles! Really interesting! I use picmonkey, but have never played with the colors and focus. I may have to experiment! That’s amazing! Mommy should has done that before she deleted all the pictures she texted to Daddy of the Rockies as she she drove through on Monday! Both are pretty shots, but I’m partial to the “natural” look. I edit everyone of my photos before posting, especially the ones I shoot on Auto. Sometimes I get better results. Even the ones I shoot on the Manual setting sometimes need cleaning up and straightening and removing trash (or people).